This loop style bike rack will keep bikes neatly organized and standing upright, even at its full capacity. 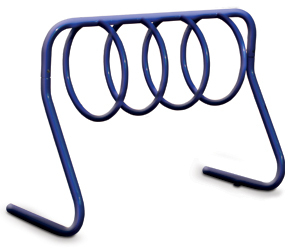 Perfect for implementing bike parking at schools, parks or shopping areas, this bike rack can easily be surface mounted to an existing surface or installed as an in-ground mount when creating a new surface. The state of the art finishing process used on the bike rack combines the application of an 'Electrocoat Zinc Rich Primer' with a durable polyester powder-coat top layer to ensure every crevice and joint is completely sealed, providing full protection against	corrosion and weathering. Bike racks are finished in either a gloss or textured polyester powder-coat finish. 2.375" O.D. ILG Steel Tubing Frame. 1.32" O.D. ILG Steel Tubing Loops.